Post street teaming pizza again and I must say, for a pair of introverts, it's a nice thing to have a pizza reward for having to ask strangers if we can hang posters in their windows. Although maybe they're not so much strangers anymore, since we've been doing this route all season. Well. We still get pizza! 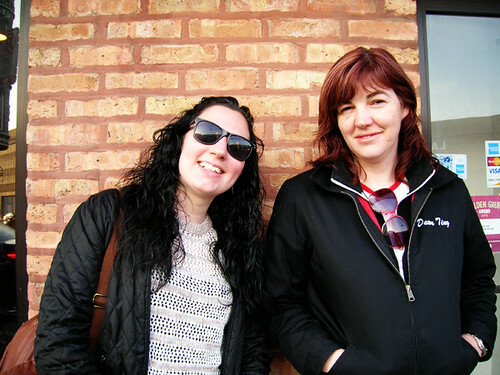 We also got my Fury teammate T. Wrecks to join in our street team and pizza quest, the three of us played together last season on Third Coast and Wrecks just made Third Coast again this week. Third Coast is RIDIC this season. This league just keeps getting deeper and deeper. Maybe time for a D team? Wrecks and Dawn. See Dawn's black eye? Badass. Me und der schweetie mann. 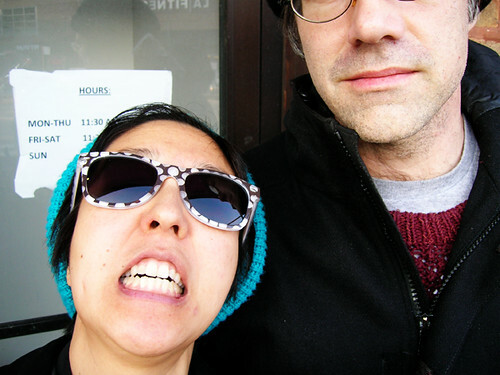 Probably the short person shouldn't hold the camera. So I just noticed an odd thing about this Chicagoist list that we're working from—Chicago is known for its deep dish pizza, right? Like what about Lou Malnati's, or Gino's. But really only four of the pizzas on this list aren't thin crust. I mean, I actually prefer thin crust. I guess that's what it says on the tin, The 20 Best Pizzas In Chicago and not The 20 Best Chicago Pizzas. Okay. I accept that. I feel I should also mention, there's a couple few good pizza places on Division where we street teamed. Like I really like Pizza Metro. I was trying to explain their crust to Dawn and Wrecks, it's not like the bready and blistery crusts we've had so far. It's like cornbready? But, not cornbread. 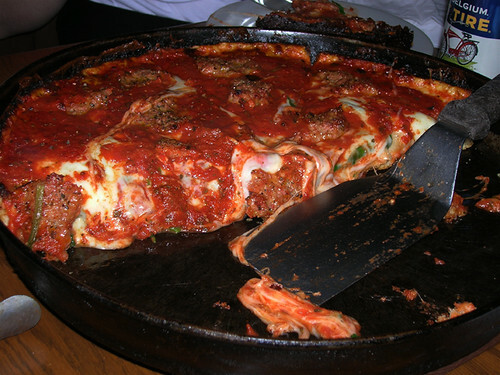 Well, it turns out that Pequod's has this crust and this is what I think of as Chicago-style crust. And you know, I've lived in Chicago on and off—really at this point, mostly on—for the past, geez, twenty-five years, and I've certainly heard people talk about Pequod's, I used to work on Webster and I knew where it was, but I never really wanted to go there, a) I had the sense that it was small and hard to get a table, and b) it has a neon sign of ...a fish. Or I guess it's a whale. Well let's start with a) the hostess is leading us to our table and I am grimacing at the table of Cub Scouts shrieking near the door, but she leads us to the back of the room and the shrieking fades, and then we turn left... and then we go up some stairs... and then we go even more back, and at this point I turn around to say it's bigger on the inside to the sweetie man who simultaneously says to me, "It's like the tardis," so we had a little soulmates moment there. The 20 Best Pizzas In Chicago Via Chicagoist. The pizza at Pequod's takes some time to get to the table, so you might as well work on that appetizer combo while you wait. And b) nevermind the fish, THIS. IS. PIZZAAAAA!!! And it is worth the wait. We got a large pan pizza with spinach and sausage, the crust was as aforementioned. Cornbready, but not cornbread. Crunchy, I guess a normal human would say. We took a few minutes to finally settle on the classic spinach and sausage combo, but it's a classic for a reason. The only reason I sometimes don't like spinach and sausage is because sometimes sausage is ...fluffy. Eurrr. But the sausage here is really dense and meaty, and nicely seasoned. We each had two slices, and we all ended up juuust full.